My three days in Korcë were so full of incident and interest that a brief blog would be inadequate, so I'll confine myself to a few of the highlights. This week, I'll concentrate on the main purpose of the visit, the testimony of some of the survivors. Without giving away too much of the book I'm writing, here are a few vignettes of some of the wonderful people I was introduced to and some of their comments. 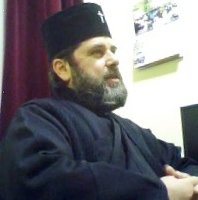 Metropolitan Joani gave me nearly three hours out of his hectic schedule to give me some of the background to the Hoxha years. He is a deeply spiritual man but has also shown a good grasp of the practical realities in rebuilding the Orthodox community in Korcë. Born in 1956, he has personal experience of the attack on religion and was, in fact, baptized secretly in 1979. His family were persecuted for their politics which led them to see religion as a positive force for good – not the result the government hoped for! In spite of the horrors of the era, he likes to emphasize the positive aspects. “I never experienced such joy in worship as during the secret services. Everybody who was a believer felt alive, so Roman Catholic, Orthodox and Muslim didn't see the differences, only what they had in common, the joy of belief. They often found themselves together in jail. The Albanian word for 'believer' is 'besimtar' but during that period they more often used the word 'shpesëtar' – 'he who hopes'” He also pointed out that the Albanian word for the devil literally means 'cul de sac' which was largely where Hoxha's rule took Albania. Then there was Vasilika, a vivacious and flamboyant seventy-nine-year-old, whose testimony was notable for its simplicity and the 'matter-of-fact' way in which she talked about actions that could have led to imprisonment or even death. She described how, without a priest, they would prepare bread and leave it in front of the icons overnight. In the morning, they would secretly listen to the Divine Liturgy broadcast on Greek radio and 'take communion' with Christ as their priest. One of the most extraordinary actions of the Hoxha regime was to ban all religious personal and place names, insisting that new babies be registered with secular or pagan Illyrian names. There was even a dictionary of approved names published in 1982 which included the extraordinary 'Marenglen' (first three letters of Marx, Engels and Lenin!) My translator, Vasil, offered a bit of light relief when he told me how he had come to be named after a saint. His father went to register his birth in 1984 and declared that he would be called 'Vasil.' At that time Albania was at daggers drawn with China, formerly an ally but now regarded by Hoxha as a bitter enemy. When the registrar refused to register a 'Christian' name, Vasil's father threatened to give his son no name at all or call him Mao Tse Tung. They accepted Vasil! All in all, my meetings with just a few of the 'people of hope' were inspiring, leaving me with feelings of humility in the face of people of such immense courage. Mixed with this was thankfulness that I had been born in a place and at a time when I could practise my faith in freedom without the fear of torture or death. Please remember the people of Albania in your prayers.